WOW, This is OUTSTANDING work ! I agree it’s a shame to block out so much of that masterpiece behind – bad beagle for doing it too well! All the same the Grizzly’s probably my favo*rite AFV so I’m not so sure about being indecisive, it’s your show. I’ve just been dredging the ‘net for civilian figs for Anthropoid and I noticed a Masterbox set of German tankers (I think) playing cards round a table I’d never seen before – they’d look good here except it doesn’t look like there’s room. From where I'm sitting the tank looks good . 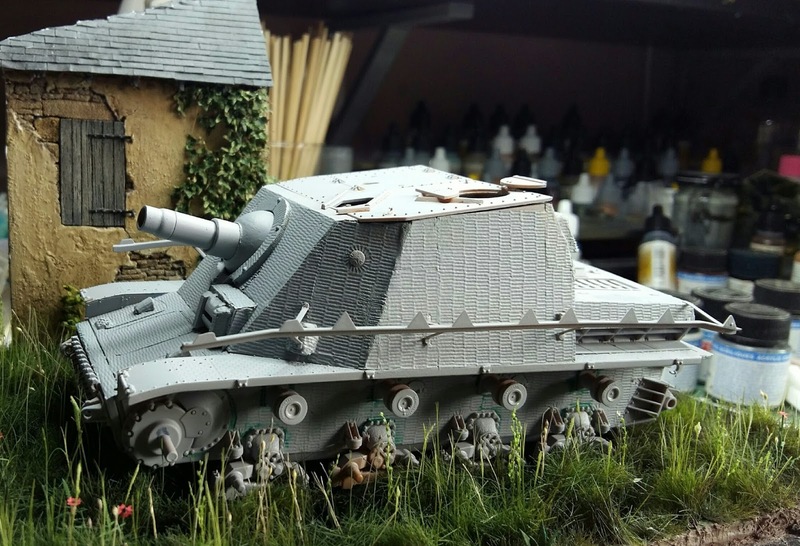 However with your own admitted issues with the tank build do you want to use it in the dio ? This is just my thoughts and does not merit any weight , seeing as you don't seem to keen on the tank could you replace it with something smaller ? It would be a shame to hide all that beautiful work on the house and wall . I have the discipline and attention span of a four month old Beagle ....... we must be from the same litter , I'm all over the place and getting into trouble too , ........ my nickname is " hey don't do that you idiot " . Hi Sean - I'll echo the words of others in that your entire setting looks great - the nice varierty of textures on the building, and the vegetation - wow! Excellent work! Splendid work so far. It looks like the vehicle and its' commander will be up to the quality of the groundwork,foliage and building ! Here's where it's at at the moment then. Sturmpanzer itself is progressing. Gave it a quick blast of primer to see what flaws (and they are many) exist, particularly in the Zimmerit. I have had a few attempts at doing this myself and only one came out half decent. Most of the time it was too thick, too messy, the stuff I was using (Milliput or whatever) got everywhere... so I decided to give the Tamiya stickers a go. Of course, they're for the later Sturmpanzer with a completely different superstructure so I had to chop it about a bit. I'll add some patch-ups where there are noticeable seams or gaps. These vehicles had quite a neat application so there was no way my own efforts would be up to scratch. PLaced onto the base it should gove some idea of the final layout. Simple but hopefully it will 'work'. The left hand side of the roof isn't fixed, I left it loose so I could tweak the commander figure to fit better. There are a few obvious patches of Zimmerit needed (and some not so obvious). The commander figure is from the later Tamiya Sturmpanzer, with a new head from Hornet (almost oblogatory) and a couple of tweaks. Not that visible here but I added a watch given his job, and a cigarette, something which apparently German AFV crews were fairly comfortable with. As ever, thoughts, comments, crticisms are welcomed. Hi Sean , yes you slay it . Excellent work so far . Love the groundwork and technique! What products did you use for the various ground cover? 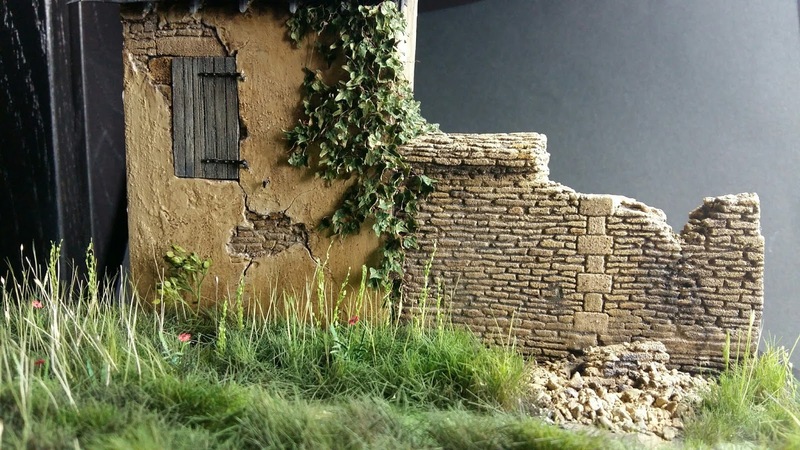 The mix of various types/sizes of vegetation is very realistic and the barn/wall look nice as well. Thanks for posting & gonna follow your progress. Be honest. 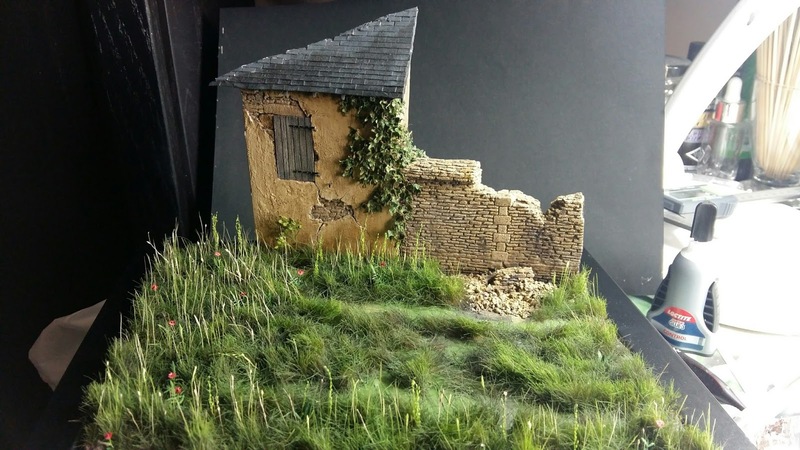 You took photos of a real Normandy barn and wall and photoshopped it to look like a small diorama base... Very impressive work sir! Sorry for the delayed replying.... been away on a short break. Mike, there are worse places to live, that's certain. 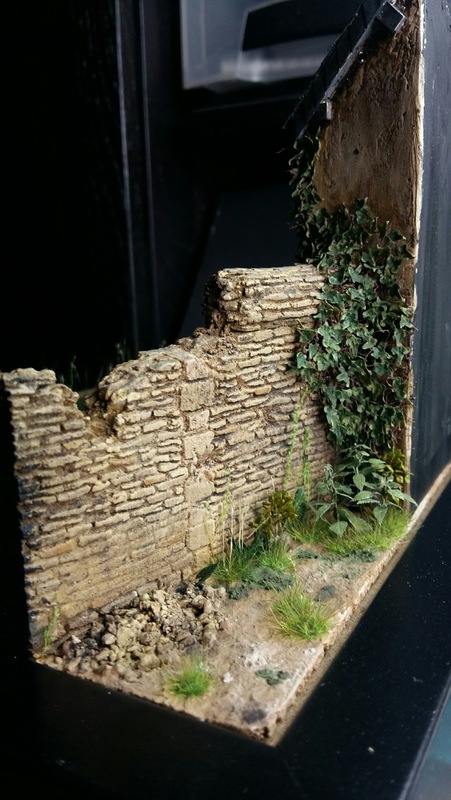 The walls will have some green bits added (moss etc) as I go along. The poppies.... well it can vary but this idea came to me on one of my visits to the Canadian Cemetery in Cintheaux. It was August, and in the fields nearby were quite a few poppies. It's dependent I guess on weather and "field usage" to a certain degree, but as Jerry mentioned above that summer a lot of stuff was left undone. More to follow in a few days hopefully. Beautiful work Sean , very , very cool !!! ............ love the Ivy . 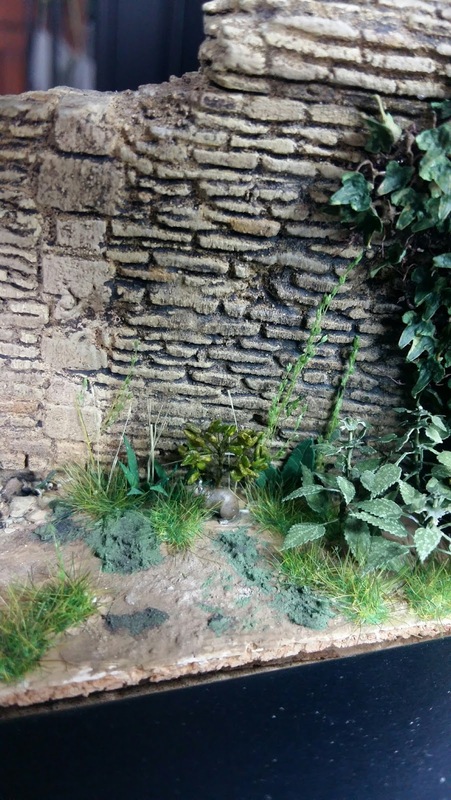 I'm really impressed,that is a beautiful diorama! I'm very envious of you living in Manche! I'm fairly familiar with Normandy as I've spent the last four Septembers and one March there. It's my favourite part of the world by a long way! Just a question...with poppies, are there a lot of them in Normandy in August? I've certainly noticed very few in September (only ever seen them at Longues Sur Mer). I really like the 'little friend' too! I certainly want one! I've also noticed a lot of thick dark green moss growing on the tops of Normandy farm walls. What did you use to prime/paint the balsa foam with ? I had similar problems so gave it a coat of heavily diluted PVA glue. This sealed it too, as any kind of knock and bits would flake off. In fact it was a couple of coats rather than just one. This was followed by Tamiya grey primer from a can. The material's softness is a bit of a double edged sword but I like working with it. There are folks who have achieved some wonderful results too. What did you use to prime/paint the balsa foam with ? I tried using it once but it soaked up all primers and paint like a sponge and didn't change color. Was it caused by battle damage or old age deterioration ? Battle damage was in my head whilst making the wall but might add some suggestive vegetation. Thanks for your comments. 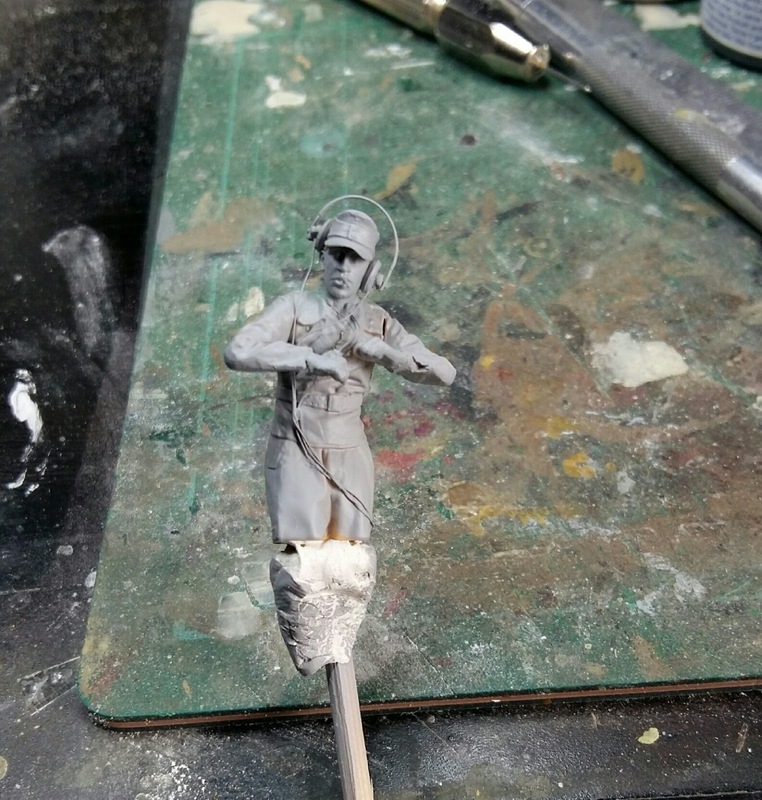 Does anyone do 1/35 bees…? I think something overlooked in a lot of Normandy dios concerning the later battles around Caen is the over grown look of the fields,etc. A lot of the villagers and farmers were absent or hiding. Really nice beginnings here my fellow Normandy sojourner. Will your vehicle be a "rolling bush"? Thanks for looking and posting Jack. Wow ! Very impressive ! The structures look spot on and have the Normandy color and feel IMHO. Barn and park wall. Nice. The veggies are very very convincing and you know I love me some veggies. Particularly nice is the multi height effect of the standing grass and plants. Very effective. I think something overlooked in a lot of Normandy dios concerning the later battles around Caen is the over grown look of the fields,etc. A lot of the villagers and farmers were absent or hiding. Really nice beginnings here my fellow Normandy sojourner. Will your vehicle be a "rolling bush"? Hey Jerry I think you’ve had a break-in! Otherwise – Sean it’s absolutely beautiful, that ivy’s particularly brilliant & as Tom said the poppies a nice touch. Does anyone do 1/35 bees…? Very nice Sean ! The little friend and the poppies are nice touches! A question about the wall damage. Was it caused by battle damage or old age deterioration ? Old age, I would put some strands of tall grass coming out of the rubble. It will show that it's old damage. I also like your vine work. 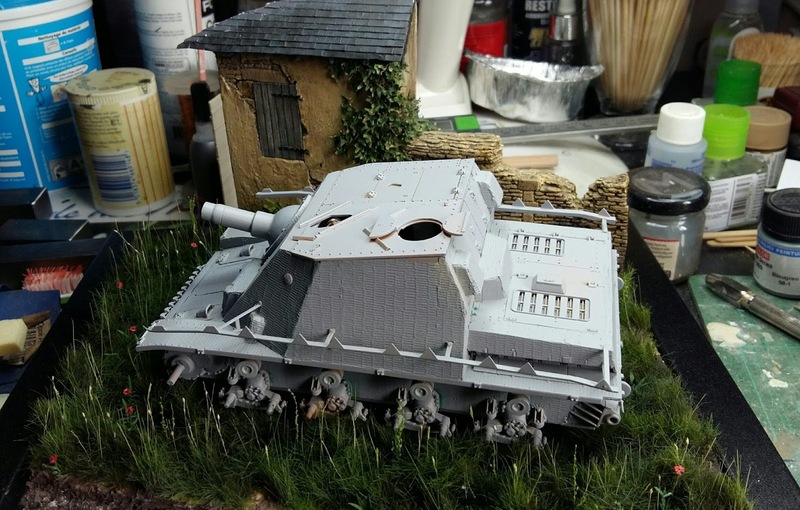 Been working on another "Normandy project".... this one is set south of Caen, just a small base for a Sturmpanzer IV I have on the go. Still work in progress, so need to sort out the roof, add some more poppies and "brighten" them a bit (which will fit with the title[TBA] hopefully), maybe some more long grass and stuff but that will probably be after the vehicle itself is in place, to help blend it in. Barn and wall are from balsa foam. Just visible in the grass is the ittle friend from Jon Smith Modellbau, picked up a pack of these at SMC last year, very nice. Any comments, thoughts, criticisms welcome as ever.